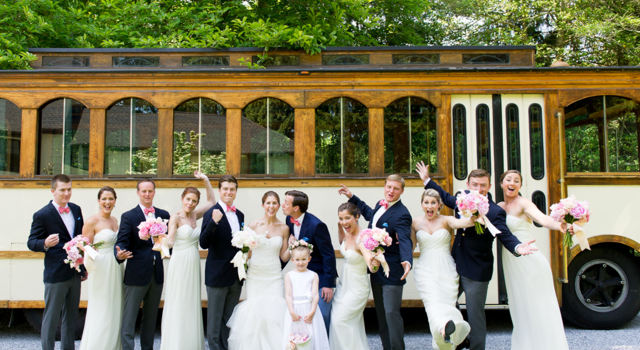 Our Trolley Rental in NJ is sure to be a big hit and we are so excited to be one of the few limousine companies in NJ to offer one of these classic transportation options! Our chauffeurs will be specially trained on driving the trolley ensuring you are safe and in the hands of skilled drivers. Bring your friends, your favorite beverages and get the party started early with a leisurely ride to your destination. Our Trolley Rentals will be available year round and do offer both air-condition and heating for your comfort. With room for approximately 28 passengers, our trolley rentals are perfect for just about any occasion. Having a wedding at the Jersey Shore? A Trolley will fit in perfectly with the landscape and you can enjoy a fun and comfortable ride while you enjoy the scenery. You can even decorate your trolley to celebrate the big day! Perfect for corporate events, team building events, proms and so much more.